Act now! Brand-new point-of-sale solutions with a 10% discount and a 90-day value date! 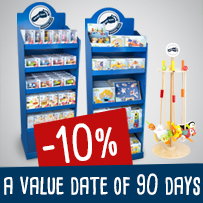 10% discount and a value date of 90 days … Profit doubly at once! We’ve expanded our constantly growing system of PoS presentation solutions with some real eye-catchers: get to know our new small foot impulse purchase shelf, the small foot “SESAME STREET” toy shelf and the fully-stocked push-along animals display (Product Nr. 11289). You can save even more now with this introduction! You can get a one-time 10% discount and a 90-day value date! And with the stocked push-along animals display, you’ll profit threefold because after the included push-along animals have been sold, you can use the display stand made of solid wood and restock it over and over again to use as a practical and attractive sales supporter. The promotional code can only be redeemed once.